Julia posted first and she got the best title, so I won’t repeat it. But you may want to go take a look at her post because her photos are better than mine, too. 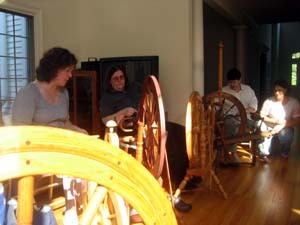 As you have now surmised, on Saturday I gathered with several other spinners at Laurie’s house. We were ostensibly celebrating Cheryl’s purchase of a Reeve’s Norwegian from Teyani but I think Lorrie’s wheel got a bit more attention than any of the other wheels. That Lendrum Saxony is a beauty. Just saying. You won’t be surprised to hear that we had a fabulous time. We ate (and ate!) and spun and talked and laughed and had a wonderful afternoon. There were babies to be held and yarn to be purchased and we even held a mini fiber swap. Thank you, Laurie, for organizing and hosting this gathering. I am blessed with truly genuine friends. 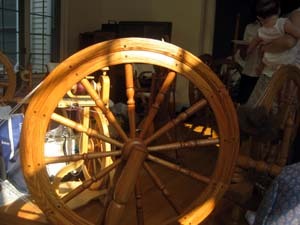 And they have excellent taste in spinning wheels, too. What a fun day for you all! And what beautiful wheels. funny…and they have excellent taste in spinning wheels. 🙂 Glad you had fun. Now *that’s* the kind of afternoon I’d like to have! Looks like everyone had a great time!! Now I am really sorry I couldn’t make it, although my Symphony would have looked a bit like the poor relative in that exalted company! Glad you all had such a good time! I have to try to organize something like that here – us spinners are so spread out we never get together. Just entered the Rhinebeck Bingo. How fun! How fun! I bet you learn a lot about spinning from each other at these events. Wow! I would have loved to be with you all. It looks like so much fun! I live in southeast Iowa, and I was lucky enough to buy my Reeves Saxony wheel from Rick about three months before they shut down production. I was going through a really rough patch on my job, and I needed some grace in my life to help me turn a corner and move on. After I bought the wheel, I had to find something to feed it and learn how to use it, and that lead me to my spinning friends. At that point in my life, they were just the lifeline I needed. 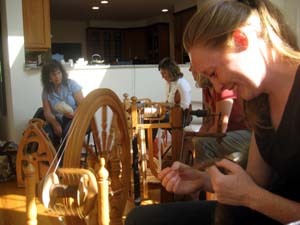 Spinners/knitters/weavers are the best—we share such a wonderful community. Looks like such a wonderful day! Makes me REALLY, REALLY, REALLY miss all my Boston gals! It sounds like it was great fun! I wish I could have been there with you all! Wait ! More new wheels! Lucky girls!! YOUR pictures really captured the autumn light on those fine wheels the best. Just saying. Someday…. I’ll have another “big wheel” (smile) in the meantime, I will enjoy Cheryl’s enjoyment of it – and that is so totally wonderful! Love the photo of you and Cheryl on Julia’s blog.